Bar Harbor is located on the northwest corner of Mount Desert Island just west of Winter Harbor. Geographically speaking, Bar Harbor is six miles west of Winter Harbor and 37 miles northeast of Vinalhaven. The image above is a view from the west looking east over Bar Harbor just west of Bar Island. Off to the right (south) is the town of Bar Harbor, while Bar Island is off to the left (north). Next up on the right a little farther up is Bald Porcupine Island, while the long sliver of land on the water near the horizon is Ironbound Island just west of Winter Harbor. The strip of islands off to the left are aptly known as The Porcupines. The first separate island on the left is Sheep Porcupine Island, which, following the line to the horizon on the left, is followed by Burnt Porcupine Island, and then Long Porcupine Island. A cruise ship (frequent summer visitors to the area) can be seen between Bald Porcupine and Sheep porcupine islands. 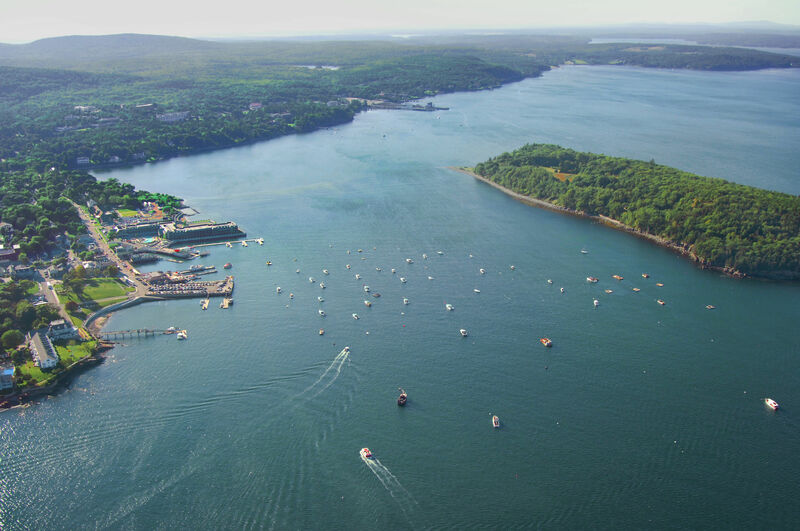 There are two major marine facilities in Bar Harbor: Harbor Place and Bar Harbor Municipal Pier. Both facilities accept transient guests at theirs slips, and both administer sets of transient moorings in the harbor. If you need gas or diesel fuel, Harbor Place pumps both. 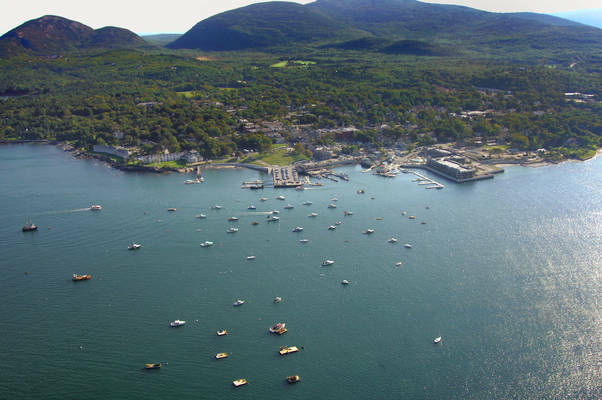 Originally incorporated as the Town of Eden, the towns name was changed to Bar Harbor in 1918. 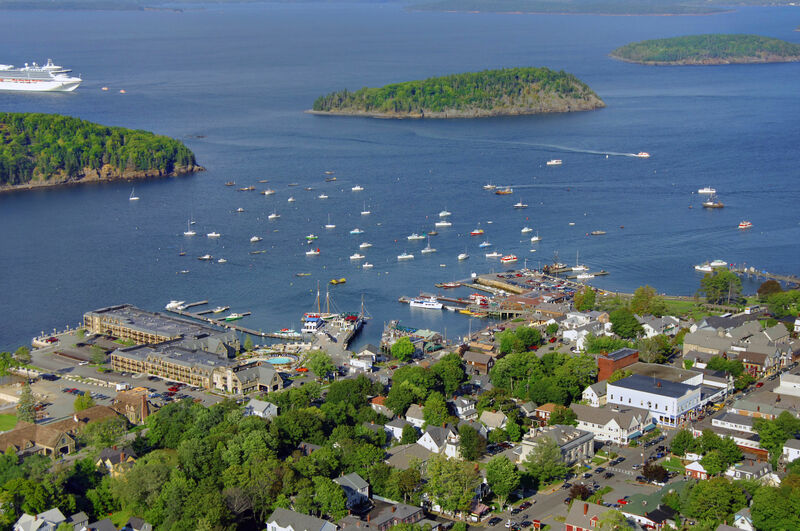 Bar Harbors fascinating history as a summer resort began long before explorer Champlains visit in 1604. The Abnakis were the original summer people. In the 1850s, painters such as Frederic E. Church, Thomas Cole, Fitz Hugh Lane, William Hart and Thomas Birch popularized the area thru their exhibits of the islands beautiful mountains and seascapes. Tobias Roberts built the Agamont House, first hotel on the island, in Bar Harbor in 1855. Alpheus Hardy was the first summer resident to build a cottage called Birch Point in 1868. More and more hotels and cottages were built as people came to the island by train and the Mount Desert Ferry to dock at Bar Harbor. 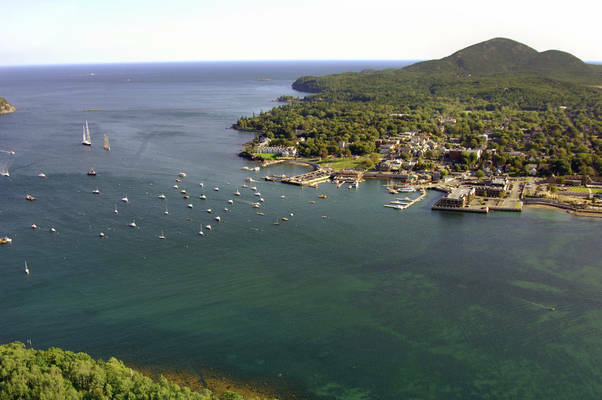 Bar Harbor is typically reached via a passage from the south or north through Frenchman Bay. If you are coming in from the north, first set a course for green can 9, which marks the location of Bald Rock and is located at an approximate waypoint of N44 25.369 W68 12.594. Once you have safely navigated to green can 9, set an approximate course of 165 degrees magnetic for about 1.8 miles until you reach green can 7 on the east side of Sheep Porcupine Island. Past green can 7, head a little farther south, and then head west into the harbor toward the moorings and the town waterfront. From the south, first set a course toward waypoint N44 23.565 W68 10.159. Once you have arrived in the area of the waypoint, set a course to the east into Bar Harbor. During the summer months, Greyhound/Vermont Transit from Boston services Bar Harbor. Since schedules vary, it is best to check with the bus line. No reviews yet! 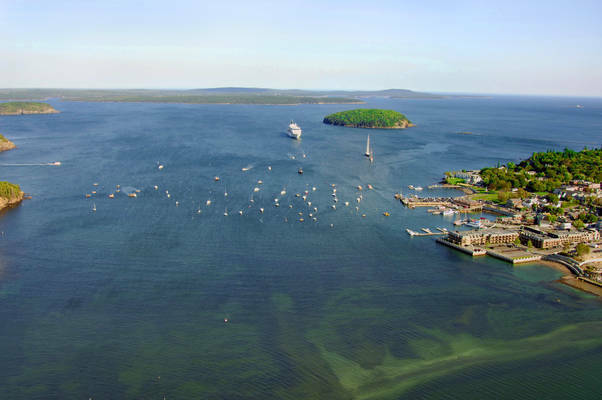 Be the first to write a review of Bar Harbor.